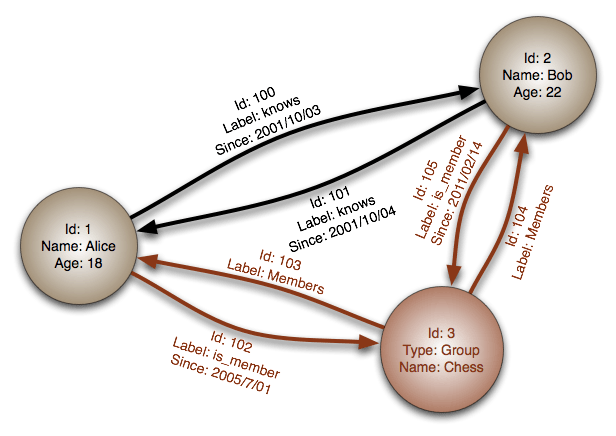 This blog is a kick-off the series that will be dedicated to the graph databases and engines, being more specifically focused on the SQL Graph, that is the newest extension to the SQL Server engine, as well as the Azure SQL Database (upcoming). For SQL Server 2017 Microsoft has decided to do some very important addition in the form of the Graph engine, which is tentatively called SQL Graph. Lead by Shreya Verma, this is most probably one of the most underrated and unappreciated effort with the relational engine. The graph of the SQL Graph will consist from a collection of the Nodes & Edges that will be represented as tables. Current implementation will allow to place one logical graph within a database (and I totally believe that this will change in the future releases of SQL Server, most probably on vNext). SQL Graph currently contains 2 types of tables (Nodes & Edges), plus the extensions for the Query Processor that allow to process Nodes & Edges. Node table represents the entity (or vertice/point) that is the crucial part of the objects for the graph schema. Within every Node Table there is a $node_id column, that will internally have a unique automatically generated name, helping to identify uniquely the object. This column will be created as a NVARCHAR(1000) with values stored as JSON. Additionally another implicit identity column will be generated as a Graph_Id, which name will contain internal graph_id column with another hex string automatically added to it. You can see that the first 2 columns within my table are graph_id_DE10743C3D514B0C8BA7B4FDAC8A6E83 & $node_id_6A94F9B73C414329B9EDBD059EB882C8, even though in the table definition they are not present at all. As I explained earlier, they are automatically generated if we define our table as a node. Microsoft recommends that a default unique, non-clustered constraint or index should be created on the $node_id, and if one is not created, than it is automatically added on the creation. These are the basic internals of the Node table. The Edge table represents a relationship between 2 Nodes within our graph (FROM and TO). For the current implementation the edges are always directed and it allows to represent many-to-many relationships very easily. You can define a number (including none) of the attributes of the relationship between those Nodes. The Edge will have 8 implicit columns that will be automatically added for every single created table, where only 3 of them will be visible for any query automatically (not hidden). And on the picture above this text, you can that the created table has 9 columns, from which 8 are those implicitly created ones. In SSMS, graph tables have their own category, or more precisely speaking – subfolders for the “tables” folder. 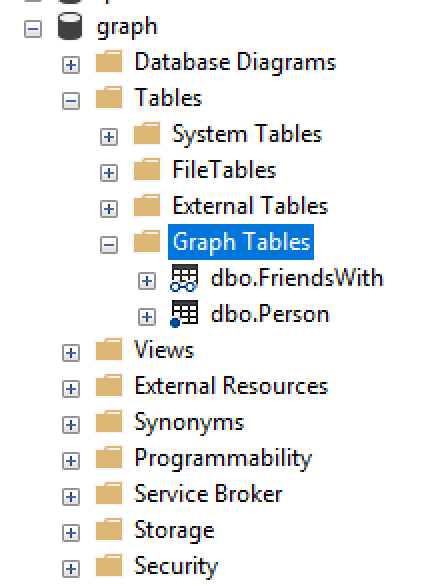 Opening this subfolders will allow you to list the of the graph tables with their icons helping you to identify the type of the table – the one with a dot near the table is a Node table, and the one with a vector connecting 2 nodes is a naturally the edge table. I love this solution, because it will help developers & DBAs to be more precise and more productive, while making less mistakes. Overall I hope that there will be some support for the visualisation of the graphs within SSMS, even though rudimentary in the beginning, one definitely has a need to be able to visualise the structure that is built/used within a graph. Alternatively in 2-3 years there will be some vendor company that will provide this can of SSMS extension, but the lack of the visualisation will harm the acceptance of the SQLGraph in SQL Server. CQL – or better known as a Cypher query language is a declarative query language that serves for querying & manipulating the graph database. The CQL was originally developed by the Neo Technology for their flagship database product Neo4J, but was later opened in 2015 and starts to conquer the graph database space as a default language. The well-known format for the CQL queries is starts with the MATCH clause that identifies what data needs to be matched with, in the following example below we are matching actor to the movie (thus their relationship). The MATCH filter for the SQL would be an extension of the WHERE clause, but in CQL this is a simple matching criteria, thus the WHERE clause should follow it (in the example we are doing wildcard search that would be doing a search for the titles that starts with letter T – like ‘T%’). WHERE movie.title STARTS WITH "T"
Now, let’s see a couple of things about the T-SQL implementation of the graph engine. The MATCH extension for the T-SQL language is a built-in improvement that allows support of the pattern matching and traversal through the graph within SQL Server. This extension is not exclusive to the SELECT statement, meaning that you can use this extension to filter rows while inserting, updating or removing rows. Notice that there is a current limitation that the MERGE statement is not supported. Where we use node_alias as the alias of the Node Table, mapping its relationship to the Edge Tables through the ‘-‘ or the ‘->’ indication, selecting the type of the relationship (if we are using the Edge Table to relate to the other Node Table for the ‘-‘ symbol or we are using the Edge Table to search within our Node Table, in the case of the ‘->’ symbol usage). Notice that the node names inside the MATCH extension can be used, while the edge name can not be repeated. One thing that I greatly dislike from the current implementation is that only the 20+ years style of join is supported, meaning that in order to take advantage of this extension, you will need to write the list of the tables that you are joining, separated by comma (,), instead of doing the modern joins, where you would right the name of the table with the join condition for each of the tables separately. I really hope that with a service pack or within the next version after SQL Server 2017, there will be this absolutely essential improvement for the query writing. A MATCH clause may not be directly combined with other expressions using OR or NOT. 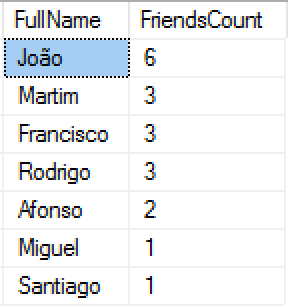 As you can see from the displayed results on the left, we have just 16 people who received those random friendship connections (out of 20), with Fransisco leading the pack with those incredible 5 connections. Is he the most important node in the graph ? We might find this out at a later stage in the next blog series, but for the moment I am already happy to be able to ask a couple more questions to this data. This is an example of building an easy understandable and processable query with this new SQL Graph engine. 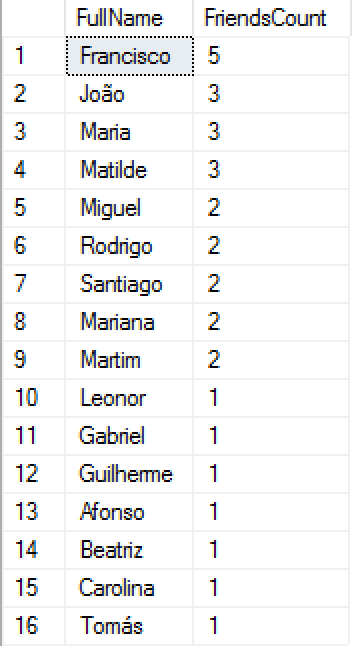 The results on the right side represent a non-complete set of the results, which is showing the names of the people who have a common friend. I love the easiness of the query construction, that will allow a lot of T-SQL developers to dive into the graph databases, without acquiring additional knowledge of a brand new language. The MATCH search condition is the only thing that one needs to learn right now to be able to start querying the graph. While R & Python integrations were and are greatly celebrated by virtually everyone, it looks to me that bashing the initial effort of SQL Graph is a kind of a popular activity online, and this is badly wrong. Judging the very first initial step in the development and evolution of the graph engine is not a very easy thing from my point of view. Of course I would love to have there transitive closure or betweenness centrality right away, but given the amount of time that the SQL Server 2017 had since the release of the SQL Server 2016, I will be more than happy to have the basic structures (nodes, edges) and the graph query processing (MATCH clause). I perfectly understand that we do not have the usual depth of the graph analysis right now (we just have new table structures & query processing format), but consider this a gentle step into the right direction which needs to be further encouraged and supported, and I am fully inclined to do so. Given the amazing people are driving this effort, I have not doubt that should they have enough time and resources, they will drive SQL Graph to become daily used by almost all data professionals part of the SQL Server and Azure SQL Database offer. Even though we must still rely on the brute force calculations for getting the full graph functionality, I feel like a number of tasks are already can be taken advantage of. The huge advantage of the progress of this rapid development is that we can start using all available technologies in combination with SQL Graph, such as Columnstore or Partitioning, without having to adapt anything. According to https://docs.microsoft.com/en-us/sql/relational-databases/graphs/sql-graph-architecture you should stick to the pseudo-names of the special columns (eg. “([$from_id]” instead of “([$from_id_51EA2C6488A34AF293E6643771BF7C2D]”) in your query examples. thank you for pointing out the typo, it is now corrected. Regarding the pseudo-names for the columns, I prefer to vary my scripts in order to explore different aspects, even those which are not suggested. The graph of the SQL Graph will consist from a collection of the Nodes & Tables that will be represented as tables. thank you very much ! I have corrected the typo. With respect to the Microsoft recommendation that “a default unique, non-clustered constraint or index should be created on the $node_id, and if one is not created, than it is automatically added on the creation”, I noticed that the actual result seems to be a generated unique index on the graph_id column instead of the expected column $node_id, as is shown in your screenprint. I think this is an old, pre-release information that simply did not get up to date, but I will clear this out and post an update soon. I played around with these new graph features but didn’t find a way to MATCH outer Joins. Do you know how this can be done? Can you do a post real-time syncing your relational data in SQL server to the graph db tables? Where should this be done? What tools should we use? We can easily see the benefits of the graph, but getting the data and keeping it updated in real-time is always the roadblock. i also would love to see this. It seems like if Microsoft wants to encourage users to build hybrid databases that combine Relational and Graph tables we need a way to keep denormalized graph versions in sync with the relational tables they are derived from.